The Cowardly Lion. 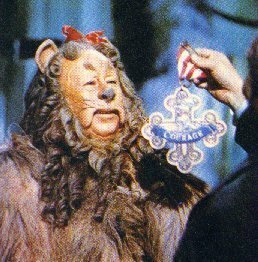 A picture of the cowardly lion accepting his medal. Wallpaper and background images in the Phù thủy xứ Oz club tagged: the wizard of oz classic film cowardly lion medal image photo. When I was a kid I wondered if it hurt the lion when they pinned it right on his chest! lol! Man, the cowatdly lion always got on my nerves - he was such a wimp,LOL! I wonder if that is really a medal from Fanpop??? Yeah,It could be a Fanpop medal it looks cheap ! lol !!! Say what? Ooooohhhhhhhh, Benni *is shocked* but am currently lmao big time! I'm only teasing !! lol !I'm such a tease lately it's that Michael Caines fault !! !